What about the Specialized Demo pants ? Specialized Enduro Evo 650b It's built as a DH bike on a enduro frame. Sold by Specialized as is ( plus a couple extras). It is my favorite DH bike because it's lighter, more nimble and much much more fun than a common DH rig. the built is sick and makes that bike unbelievably fast and fun. it's 7" of travel front and back. specs: Enduro evo large frame with a 7" Olhins TTX boxxer team dropped to 7" with charger damper, coil spring and Olhins yellow matching boxxer stickers. was rebuilt 2 weeks ago. Sram XO derailleur 10 speed converted to 7 speed roval traverse DH 650b wheels with DT Swiss 240 rear hub zee calipers with XTR levers ( equivalent of a set of Saints) with formula 2 piece discs. easton haven aloy 35mm bar and stem 34T N/W chain ring with Blackspire top guide Easton carbon Havoc seatpost The bike brand new was something 6500$ plus taxes. 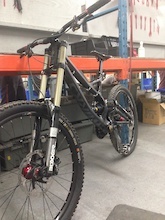 it rode 4 weeks ends in Bromont at the most and a couple of days in Whistler. Everyone who tried that bike loved it. I traded my s-works demo for this and have no regret. 2900$ is what i'm asking, it is cheap cheap. NO LOWBALLS/NO TRADES Can come with spare parts but that we have to negotiate. NO PB messages, i don't check very often. email or phone/texts 1-(514)-929-6205 je parle français et je peux me déplacer. Specialized Stumpjumper Evo Expert the fastest and most capable AM bike i have ever owned. bought in january 2016, first owner only the brake levers are not stock. specs: XO1 derailleur, cassette, carbone crank and shifter. Large carbon Stumpy 29" evo frame rock shox pike 140mm fox CTD Kashima 135mm 29" roval traverse wheels truvative 60mm stem, specialized dh handle bar Sram trail 7 callipers with elixir carbon levers specialized 125mm dropper with the new trigger specialized henge saddle. 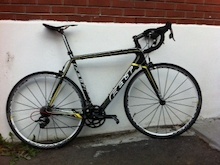 the bike is ready to rock and can definitely do more than you would expect ! Not my first Stumpy and not my last. It's my first 29" and not my last either ! i have no problem negotiating but NO LOWBALLERS/NO TRADES. buyer pays shipping, willing to use paypal. no PB messages, i don't check very often. email or phone or 1-(514)-929-6205 je parle français et peux me déplacer dans le grand Montréal.